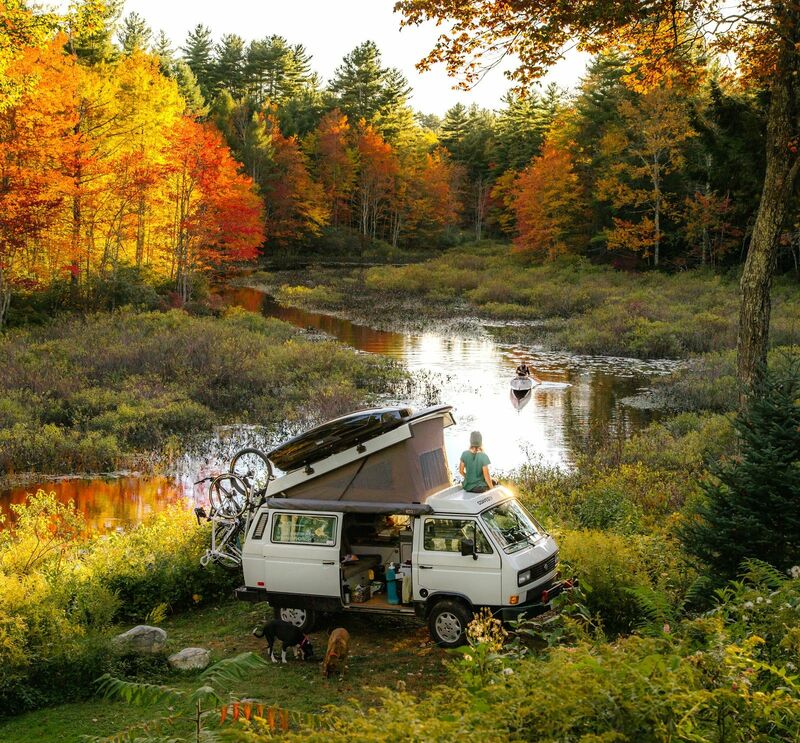 Emily King and Corey Smith live with their two pups in a 1987 VW Vanagon named Boscha. 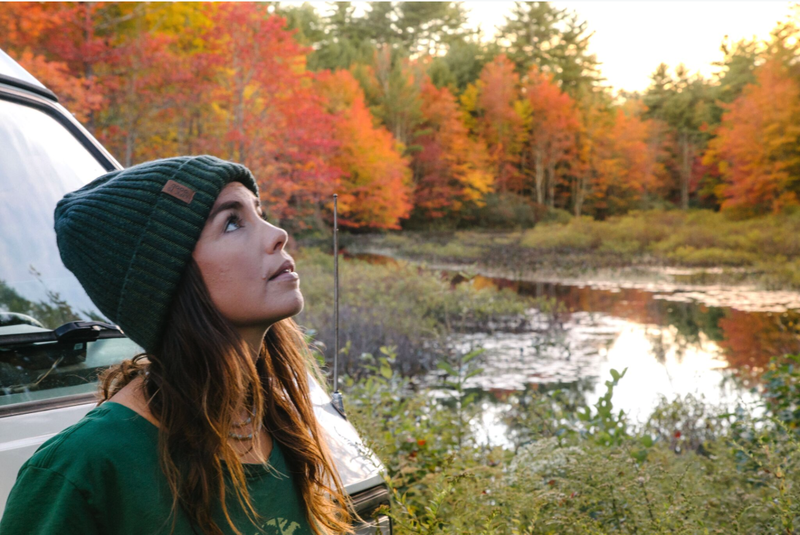 As members of the #GoodVibeTribe, we asked them to share their perspective on the mind-body benefits of time spent outdoors. I don’t live in a van to live in a van. Sharing 80 square feet of space with a partner and two dogs is all sorts of cozy, but I really chose this lifestyle to be outdoors. Nothing brings me more joy than practicing yoga in the fresh air, blazing a mountain biking trail, scoring waves, watching spectacular sunsets, and hiking away from civilization. I didn’t always prioritize time outdoors. Before my life on the road, I worked 9-5 for a real estate agency and freelanced for The New York Times. I thought I had to earn my time outdoors—two weeks’ vacation per year—resulting in the occasional hike or surf session. I would go to a gym to burn it off, but the stress accumulated. My anxiety was sky high. I’m not alone in my susceptibility to the stress of modern life. In fact, a 2017 Stress in America study found 75% of Americans experience at least one stress-related symptom in the course of a month. The values of progress, competition, and purpose are deeply ingrained in our culture. They motivate us to move forward, but they can also lead to burnout. 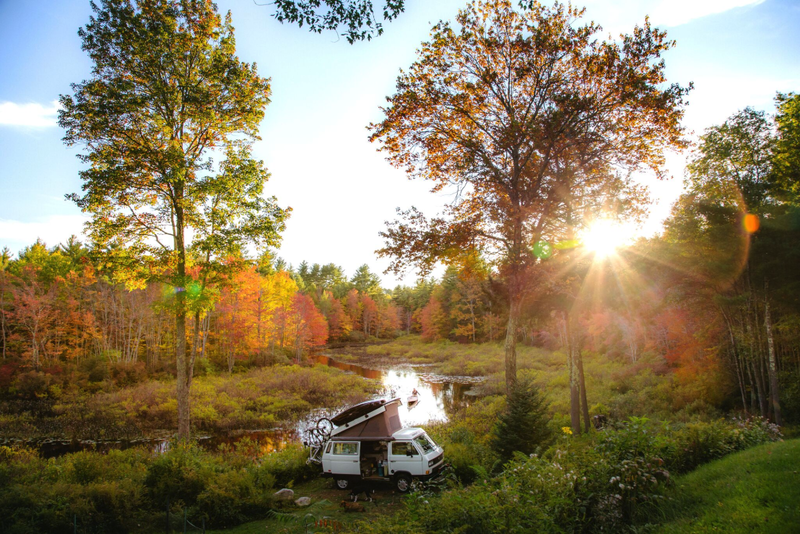 After six years exploring North America in our van, I understand the importance of spending time in nature. And while I’ve always known that being outside makes me feel good, I’ve recently stumbled across the science that backs it up. A warm sunny day turns stormy in the blink of an eye. The ground beneath your feet is muddy from yesterday’s rain. A cold winter day requires extra layers—and even with them, you’re still chilled. A hot summer day leaves you sweating bullets. The hike to the top is tougher than you expected. The outdoors can sometimes be uncomfortable, yet it is this very quality that improves our physical and mental health. For example, exercising in the cold increases your immunity. Walking on uneven terrain increases your proprioception, which is your ability to sense your body moving in time and space. Spending time outdoors leads to more adaptability and resilience, which carries over into all areas of life. When we immerse ourselves in nature, our to-do list fades into the background and our awareness is captivated by our surroundings. Trees rustle with the sweeping breeze. A cascade of leaves dance as they fall. A green dragonfly makes a home on our hand. Our heartbeat mingles with the swoosh of the river. Our mind is at ease and then, begins to wander. This is a state of consciousness known by neuroscientists as soft fascination, in which we feel calm and meditative yet our imagination is active. It’s a sort of daydreaming state that makes space for creative ideas and a sense of well-being. It is a state that compensates for the screen time, traffic jams, and stress that many of us experience daily. A recent report that analyzed upwards of 190 million people concluded that time outside significantly improves our health, from reducing our risk of type II diabetes, cardiovascular disease, and stress, to improving our sleep habits and gut health. I invite you to take a moment to imagine a life where you prioritize time outside, where every day you feel at ease with yourself in a changing environment, where your creativity leads you down the path of exploration, and you feel your healthiest. The great outdoors helps us all thrive.